So Jon assures me that our camera works if I just go old school and manually focus it. Of course, this takes away the benefit of being able to snap a kazillion photos per second in order to get one decent shot of my kids. We will get a new lense soon, but until then, you'll have to bear with our slightly blurry manually focused kids. These are just some random shots from the weekend. I'll be two next week, and my mom and dad are seeing a lot more of this face around the house (except usually I am throwing myself on the floor, burying my head in the ground, and passionately wailing in high drama). This week and next are crazy busy. This week is the big porcelain sale, Jon has an exciting adventure on Thursday (more to come on that one), and the movers come for the walk through on Friday (can it really be happening?!). Next week is Maddie Rae's surgery and 2nd birthday. She will have her surgery to close her soft palate and insert tubes in her ears on Monday, May 5 at 10 am (10 pm Sunday night for you Eastern time zoners). Her big 2nd birthday is on May 8, but we will probably wait to celebrate until she is feeling better. I'm dreading the surgery and hospital stay, but I will be SO happy to have this behind us and to have her mouth completely healed. 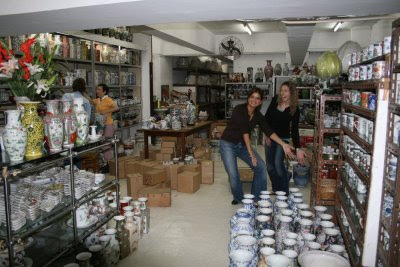 We made a great Hong Kong discovery about a month ago: Overjoy Porcelain. Overjoy is a porcelain business run by a sweet husband and wife duo, Arthur and Josephine. They sell beautiful hand painted porcelain and have exported to Neiman Marcus, Saks Fifth Avenue, and Lord and Taylor. They are selling off the porcelain and retiring to Canada, and after we spent an afternoon buying so much we probably funded their plane tickets, they told us of their generous plan. They planned to give the remaining porcelain free of charge to charities until it was all gone. This got our wheels turning, and Carol had the great idea to ask if our church could have some of the porcelain for a sale to benefit orphans in China. They said yes, and we went yesterday to pack up the porcelain. Imagine our surprise when we walked in the room and saw loads and loads of porcelain that they had set out for us. We packed up 70 boxes, and we are having our sale on Tuesday and Saturday this coming week. 100% of the proceeds will go straight to orphanages in China that are near and dear to our hearts. 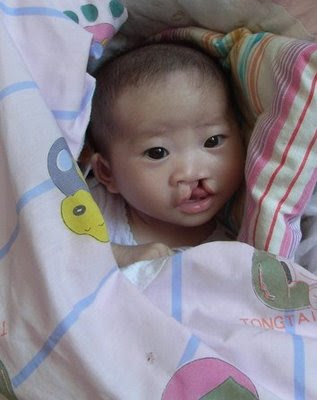 The Hicks plan to take part of the money directly to the orphanage where Zoe spent her first few months in Guangdong, and we hope to be able to fund a cleft lip/palate surgery for one of the babies at the Anhui Cleft Healing Home. 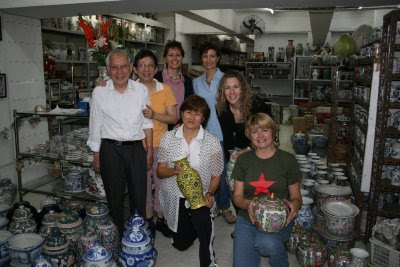 We also still know of several needs at the orphanage in Hefei where Ellen came from, and we hope to also help them out. 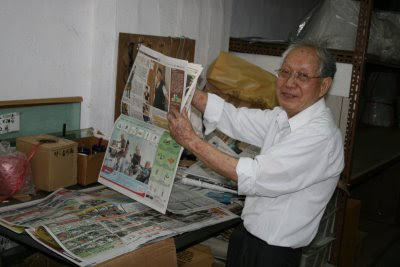 Please join us in praying that our sale will be a huge success, and that many children in China would benefit from Arthur and Josephine's generosity. Pictures below are credited to Carol (which I lifted from her blog because yes, you guessed it, still no camera). Arthur helping us with the packing. Our crew (minus Sandy) with Arthur and Josephine. All the porcelain on the floor was for us (and it wrapped around the aisles too!!). Jeannette, Nikki, and Sally wrapping up the porcelain. Sandy and I showing off the goods. This is little Wren, who is living in the Anhui Cleft Healing Home. We hope to be able to sponsor surgery for her or one of her friends in the home. Couldn't you just scoop her up?! Jonah: Awww. I want turn back into a baby. Jonah: Because I was so cute. I need a fairy. Jonah: So she can come over and turn me back into a baby. Jonah: Stop laughing! I'm serious. Jonah: Mom? Do vets get married? Jonah: Awwww (major disappointment). I don't want to get married. Mom: You don't have to get married if you don't want to. Jonah: What doesn't get married? Mom: Well, anyone who does anything can either get married or not. You can decide. Jonah: I don't want to get married. I just want to be a vet. It's really annoying to have a broken camera. I have to resort to posting things like graphs and charts. Hopefully it will be up and running again soon (whenever we can bring ourselves to fork over the money for a new lens), and I will be back to posting pictures of the chillins. Until then, I will entertain you with a few quotes from our middle child, Jonah. Jonah is really funny, but if we tell him that he gets really angry. He thinks being told he's funny or being laughed at is an insult. I guess there's no stand up routine in his future, but I do want to write a few down just for my own future benefit. "Mom! I'm hungry. I need some junk." M: "Jonah, don't you remember it's Healthy Eating Week?" J: (shoulders slumped, dejected look across his face) "Awwwww. I'll eat something healthy after my cream egg." M: "Jonah, do you want some of these sweet grapes for dessert?" J: (clearly VERY confused) "What? Grapes? GRAPES?! Grapes aren't junk, they're fru-it." See the Kelley Pictures Beijing 2008 movie here. Then jump over to here to see what I was up to yesterday. We just received the repatriation initiation from Lexmark. We will now proceed to initiate the various services for your departure, including the pre-move survey of your household goods for shipment, termination notice to your landlord, etc. 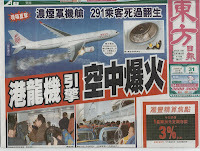 Noted you are planning to depart from HK on June 29. In honor of her first 6 months with us, Jon has made another Maddie Rae movie. Click here to go to our website and then click on "Maddie Rae 2." May we all seek to know how He intends for us to "look after" children who do not yet know the love and nurture of a family. Jon doesn't want me to post photos from Beijing because he always makes a movie for each of our trips, and he doesn't want me to reveal the photos before the movie is "released" on our website. However, I feel I need to share a little glimpse of our trip other than our eventful ride home, so here are a few snapshots. We went to a section of the Wall that was not so touristy called "Mutianyu". We rode chair lifts up and there was a luge slide down, but it was snowing the day we were there, so the luge was closed. Helen, our guide, said that she had never seen snow at the Wall before and that it was something very special (and cold). Ah, this is the last photo taken with our camera. Right after this picture was snapped, Jon set the camera on the camera bag thinking the strap was around his neck. It wasn't. We heard a loud, "NOOOOOOOO!" and the camera plunged down to the level the boys are on in the picture. Mammy and Grandude at the Great Wall of China. Chinese people have often not seen westerners and they love to stare, surround us, and take pictures with us or of us. I like to pretend that I'm Angelina Jolie when the "paparazzi" swarm me. You can see our admirers below at the Forbidden City. We went on a Hutong tour in rickshaws and were invited into an older couple's home. This is their courtyard complete with birds that said, "Ni Hao" clear as a bell. The boys loved them and Jack asked the woman if he could take one home. We also went to the acrobat show, Kung Fu show, and Tiannamen Square. I'll post a link to the movie whenever Jon finishes it. Aside from dropping our camera at the Great Wall, getting stuck in a 3 hour traffic jam trying to go to the Kung Fu show (which we never got to that night), almost losing our wallet in the car (but thankfully getting the driver to come back to the hotel with it), and almost dying on the way home, it was a fun trip. Okay, I promise this will be my last post about our near death flight. We are still processing and experiencing a bit of PTSD, and the blog is evidence of that! Carol just sent me this link. It was shot during the whole thing if you want to "relive" the experience with us. Next post will NOT be about this flight...I promise! The people interviewed in the video were from the group that helped us. They were so nice. My mom and dad are heading back to the US on a 747 right now. Thankfully, it has 4 engines! 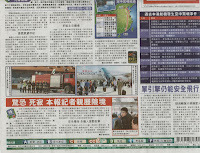 Oriental Daily News (reporter was on the flight). The group pictured was a very kind group of people who helped us get food and told us what was going on when all the announcements were made. Thank you Ingrid and friends!